Weber is one of the best-known names in propane gas grills. They have proven time and time again that they build one of the most reliable and innovative grills in the industry. 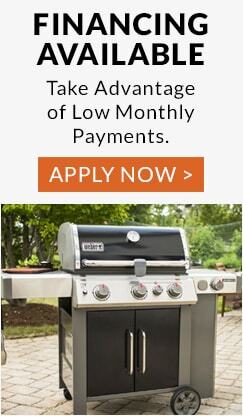 Fans know that Weber propane BBQ grills will provide many years of outdoor cooking at an affordable price. Since 1951, Weber has offered one of the best grilling experiences with dependable, well-built grills and continue to innovate to this day. The Biggest Name in BBQ – The Weber Kettle was the grill that started it all in 1952. In the 70s, Weber created a propane gas version of the iconic charcoal Kettle. It’s now available in many configurations, including stand-alone, on a post-mount, and even on a cart. 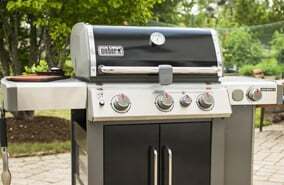 Weber has spent decades perfecting their propane grills. Reliable Cooking System – Weber has created a cooking system with unmatched heat distribution that minimizes hot and cold spots, ultimately giving you a more consistent cooking surface. A great cooking experience can be expected every time when using a Weber propane gas grill. Plenty of Options to Choose from – Weber’s propane grills can’t be converted to natural gas for safety reasons, so they’ve created a variety of grills compatible with each fuel type. This gives consumers a chance to explore every option, feature, and specification so that they can get their grill purchase right the first time! The Weber Genesis II propane grills are available in an array of colors, with a stainless steel lid, and as a Special Edition. This grill is available with either 3 or 4 burners. See our Weber Genesis II comparison chart to help decide which one suits your needs best. The Weber Summit propane BBQ grill collection includes the only Weber propane grills that are available in built-in or freestanding and also have 4 or 6 burner configuration options. Weber also offers a Weber Summit Grill Center version which has a Weber Summit grill seamlessly integrated into an outdoor kitchen island. The Weber Q portable propane gas grills are a great option for camping and tailgating as they are very compact and can be fueled by a portable propane cylinder. To learn more about the differences between the different Weber propane grill collections check out our Weber expert reviews. To discover more about Weber, and their propane grills, check out their Weber brand page.